The 80’s was calling and wanted our guest bath back. No problem. 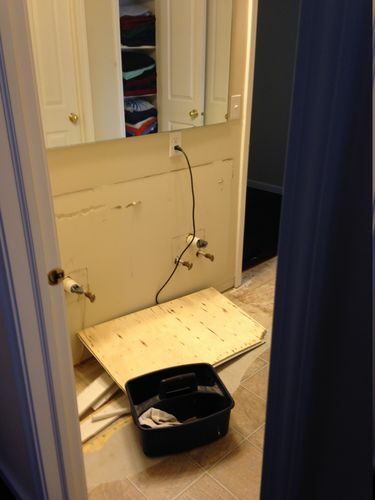 Removing the builder’s vanity was made difficult by the floor. The floor was installed after the vanity so the vanity was sunk down a little bit. The builders prefer to install flooring last so it’s not accidentally damaged by workers. This practice also restricts the builder to using a cabinet style vanity. We want to do it right. We will use a floating (wall mounted) vanity which means doing the whole floor first. If someone wants to change out the vanity someday, the floor will still be fine. Removing the vinyl flooring is pretty easy but the staples and small nails used to hold down the luan (1/4 inch plywood) must be pulled manually – a tedious task. 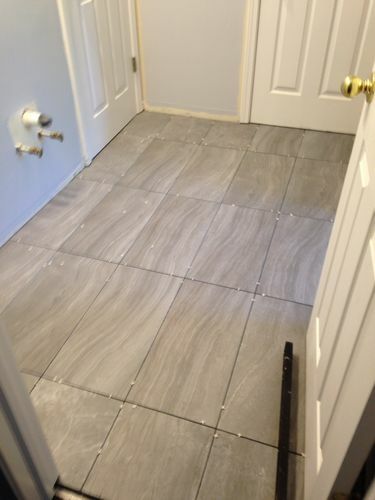 I put down 1/4 inch hardi-backer and we chose some gray porcelain tiles. When installing a wall-mount vanity you need to install additional structure in the wall first. The vanity will have specific locations that must be tied to studs. Installing a 2×6 across all the studs horizontally will give you something solid to tie the vanity in to. I installed a 2-button toilet (dual flush, 1,0 and 1.6 gal) – but you don’t need a picture of that. To finish off, we put in a glass mosaic back splash. Here’s a tip: When grouting a floor or back splash, the grout should be a background color. You don’t want grout to become a “feature” in your bath or kitchen. 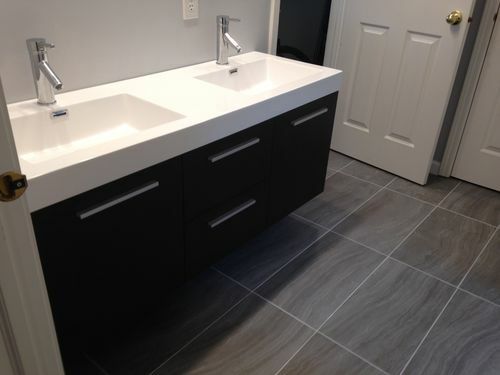 In this build, my floor grout was chosen to be gray, but for some reason it whitened after installation. I was not happy with that. I used a different brand for the back plash and you can see the difference – it just fades away and you don’t notice it. Lighting: I replaced the traditional wall fixture over the sink with recessed, dimmable LED lights mounted in a small, hopefully not too obtrusive, soffit. -- Measure twice, cut once. Great work, what material is the vanity unit made from? The cabinet and sinks are sold by Home Depot on-line! You can look up all the specs there. It’s the Virtu line. Yes. The floor sits higher. I make little oak transitions on my table saw. Each side sits at the correct level. This (and I suspect most) floating vanities are designed to go flush to the wall, so you would need to cut notches in the vertical 2×4’s and install the 2×6 so it spans the width you need and allows for drywall. The wall studs are only every 16” (if you are lucky!) and they don’t always match up with the bolt points of the vanity. 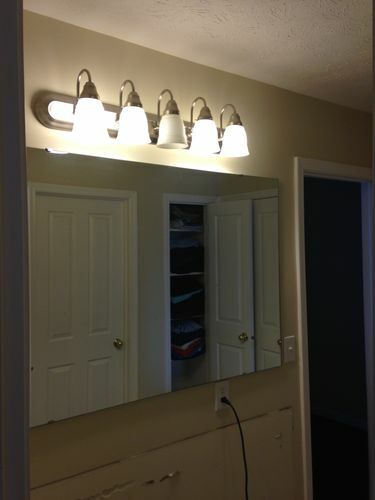 Frankly – buy the vanity first and look at the mounting instructions BEFORE you finish the wall. I have always wanted to revamp my bathroom but thought it was too much work. I think a simple feature wall and a storage cabinet could change so much! Loving the tile work behind the vanity counter. Makes the whole mirror pop and brings a bit of character into the room. Definitely very good work so thank you for sharing this job!